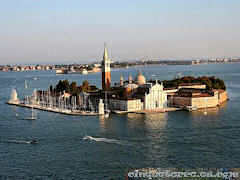 Venice is unique among all great cities of the world in that its streets are full of water. Made up of 118 islands only two to four feet above sea level, crisscrossed by 117 canals, and connected by some 360 briges. The richness, color, light, texture, and history create a scene of overwhelming beauty. The whole city is an extraordinary architectural masterpiece in which even the smallest building contains works by some of the world's greatest artists such as Giorgione, Titian, Tintoretto, Veronese and others. The main artery of Venice is the Grand Canal, Canal Grande: the longest canal in the city. Along the Grand Canal the richest Venetian families built about a hundred marble palaces with their front doors looking onto the water; their style is influenced by Byzantine, Gothic and Lombardesque. A boat trip on a vaporetto along the Grand Canal is the first and easiest approach to Venice beauty and a great chance to taking pictures; much more exciting (and expensive) is a gondola tour. Piazza San Marco, the grandest square in Venice, and the only which is actually called a piazza, this is dominated by the St. Mark's Basilica and the Duke's Palace. The most conspicuous feature of the city is the 91m high Campanile San Marco which was built between 874 and 1150 and reconstructed after it collapsed in 1902. To the rear of the Dukes's Palace is the famous Bridge of Sighs, which connects the palace with public prisons and was the route by which prisoners were taken to and from the judgement hall. 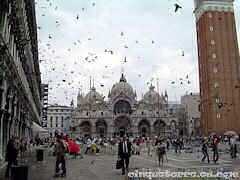 St. Mark's Basilica was built to house the reliquary of St. Mark and the saint's tomb is the focus of the cathedral. It has one of the most unique architectures of any church in Italy. Various of its elements were contributed from Byzantine, Romanesque or Arabesque styles of architecture and combined into an extremely pleasant and harmonious presentation. The Duke's Palace contains numerous treasures of the art world. The decorations are extraordinary and include works by the master artists of the Venetian Republica. Be sure to examine the works of Tintoretto and Veronese. The Museo dell'Opera on the ground floor includes the original capitals from the columns of the building, as well as other interesting items. The largest canal in the city, the Grand Canal is almost 4 km long and up to 70 metres wide. Many famous buildings are situated on its banks, including the baroque Church of Santa Maria Della Salute, the Accademia Gallery, the Corner-Spinelli and Grimani Palaces. 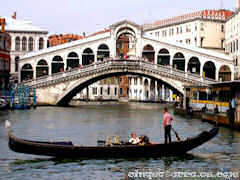 It is crossed by three bridges: the Accademia, Rialto and Scalzi. Basilica of Saints Giovanni and Paolo is the largest Venetian gothic church and contains the burial monuments of Doges and other important citizens. Visit the Peggy Guggenheim Collection, it is filled with European and American art from the first half of the 20th century and includes the personal collection of Guggenheim. The museum is housed in Peggy Guggenheim's former home, Palazzo Venier dei Leoni, on the Grand Canal. The Gallerie dell'Accademia houses an incredible art collection that chronicles the history of Venetian artists, including works by the major Venetian Masters. The Museum is very popular and we recommend that you reserve your tickets online in advance.